Hotel Maroseyka 2/15 tells about the first grocery store with a luxurious interior, a set of exotic food products and rare wines. It was discovered by merchant Grigory Eliseev in 1901 and immediately became the center of public attention. 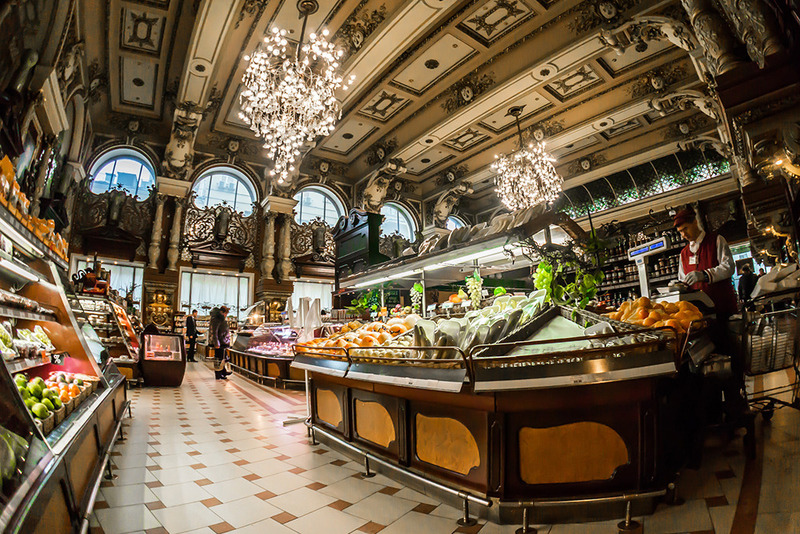 The first name was “Store Eliseev and the Cellar of Russian and Foreign Wines”, in 1920 renamed Gastronome # 1 The current name of the store is “Eliseevsky”. A distinctive feature of the store was the placement of its own production facilities at it: a bakery, a pastry shop, salting, smoking shops, butter jars, coffee roasting, and a sausage factory. In 2003, the halls were restored, part of the interiors of the shop of the times of Grigory Eliseev were restored – gilding on the upper parts of the columns and lattices, stucco moldings. Restored ceiling crystal chandeliers made in the form of vines, replaced by tile floors. Since 2004, the store has become a non-stop self-service supermarket.